Jharkhand is a state of India which is located in eastern India. It has the famous ‘Betla National Park’. Ranchi is the capital of Jharkhand state. It has a number of reputed engineering colleges, including National Institute of Technology (NIT), Indian School of Mines (ISM), etc. A large number of students enrolls every year in the engineering colleges of Jharkhand. The literacy rate of Jharkhand state is approximate 67.6% as per the census 2011. 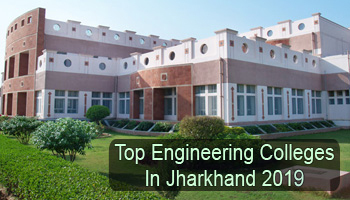 In this article, we have listed the Top engineering colleges in Jharkhand 2019. We have listed the top engineering colleges in Jharkhand for the academic year 2019-20. We have gathered the information from all around to provide the list of best engineering colleges in the state. Here we have considered various factors into consideration for listing the colleges. We have rated the colleges on the basis of various factors for the convenience of the students. We rated them on the basis of quality education, faculty member, state-of-art infrastructure, affiliation and approval, academic and accommodation facilities, students feedback, placement records, etc. Students those who wish to get admission in engineering colleges of Jharkhand state, they will apply through JEE Main & JEECE. JEECE is a state level examination organized by the JCECEB for admission to the B.Tech course. For admission to the NITs, students have to qualify the JEE Mains exam. Some Universities of Jharkhand state will conduct their own admission test for admission to the engineering courses, such as CUCET, BITSAT, etc. The colleges offer various specializations in engineering courses in the state of Jharkhand. Some of the popular specializations of B.Tech course are Computer Science and Engineering, Mechanical Engineering, Electronics and Communication Engineering, Civil Engineering, Electrical Engineering and Petroleum Engineering. If you have any other queries about Top Engineering Colleges in Jharkhand 2019, you can leave your comments below in the comment box. Value of all colleges are different?